Done! 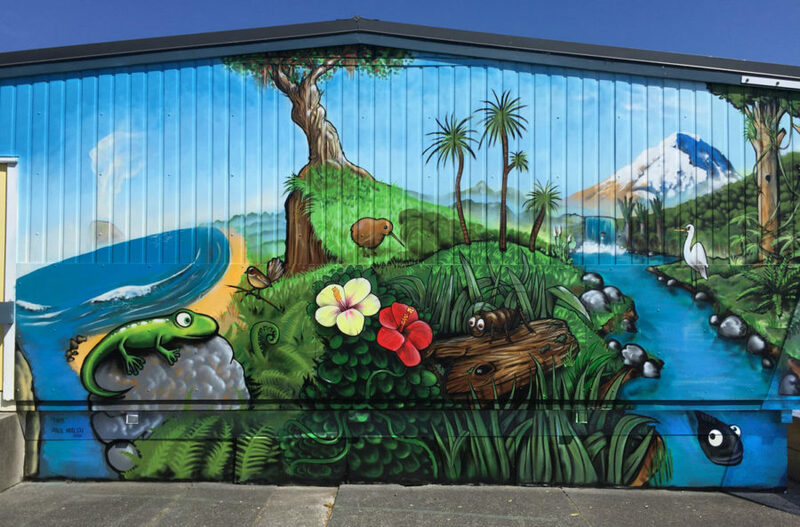 Huge thanks again to everyone that donated money and paint, particularly Cracked Ink, Dulux New Zealand, and that one super generous guy that donated $400. The wildlife includes (L-R) a gecko, a fantail (pīwakawaka), a kiwi, a weta (and a huhu grub hiding below him), an eel, and the majestic – but unfortunately endangered – white heron (kōtuku). Tangaroa is the god of the sea, and is the estranged brother of Tāne. They don’t get along – which is clear when you see waves attacking the coast! – so if humans ever leave our domain and head into the realm of Tangaroa, we must pay him the respect he deserves. Personally I love snorkelling and spearfishing, and enjoy getting into the ocean around the North Island as much as I can- and, of course, I love my kai-moana (seafood)! 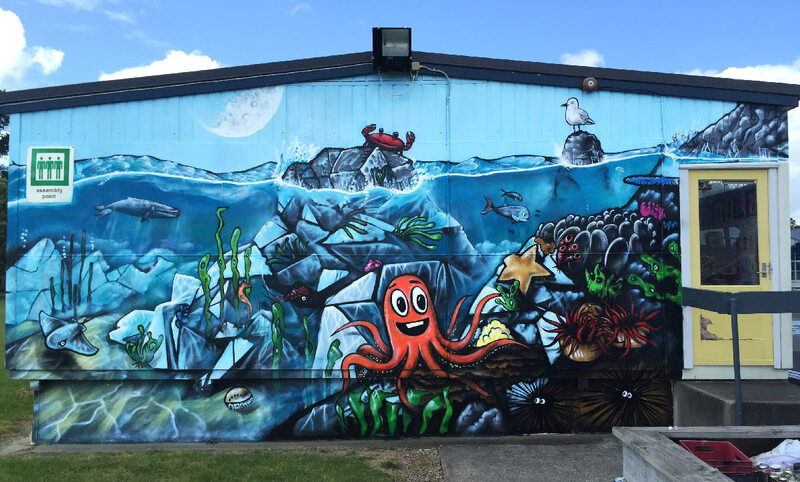 This wall reflects that – crayfish, mussels, snapper, pāua and kina (sea urchins) all make an appearance. I also added my three favourite underwater creatures; an eagle ray, a blue whale, and of course a very happy octopus. Thanks again to all those that donated. 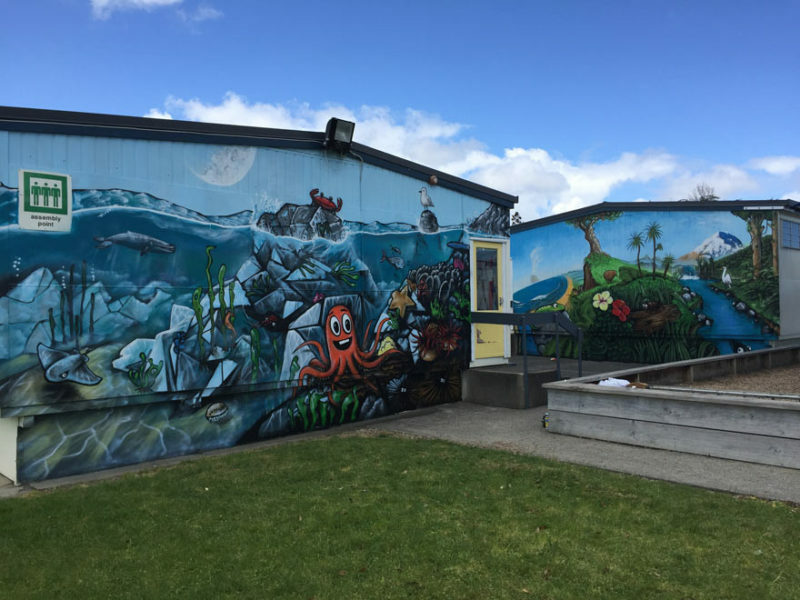 The kids (and staff) absolutely love the walls, and I hope they inspire them to fall in love with our amazing natural environment as much as I have!